Here is a Prayer found at the Ravensbruck Concentration Camp. “O Lord, remember not only the men and women of good will, but also those of ill will. Easter Sunday will be a Sunday rich in music and celebration. There will be an Easter Brunch — Suggested categories: Egg dishes, pastries, fruit, bagels, other tasty items that you enjoy. And of course our Egg Hunt for the children will follow our worship. Invite friends to join and sit with you. LIRS/Lutheran Immigration and Refugee Service: Kristy Herring from the LIRS office in Baltimore shared this story in our skype call. Kristen Kiley sent this link to the story about the Congolese mother and daughter who were separated for 4 months when they sought asylum in the US. It’s another Good Friday through Easter Story. Keep in your prayers: Olavi, Don, Danny, Drew, Dennis, Sue, Ed, Spoon, Marshall, Mike’s dad, Brian and David, Brian, children separated from their families, those living with addictions, those seeking employment and a living wage. Jazz Church West Sun, Apr 1 5:00pm Only April fools will miss this! See you at the Seder or on Easter morning. “It helps now and then to step back and take the long view. The Love of God is not only beyond our efforts; it is even beyond our vision.” This quote (continued at the bottom of my blog) is by Archbishop Romero of El Salvador who was assassinated on March 24, 1980 while celebrating the Eucharist because he challenged oppressors and spoke in defense of the poor. He has recently been made an official Saint by Pope Francis. Peace as Sanctuary: We had a marvelous skype conversation with Javier and Kristy Herring this past Sunday. Since 1939 LIRS/Lutheran Immigration and Refugee Services has been engaged in this work! Their comprehensive picture of immigration and refugee dynamics, their clear communication and the spirit in which they conveyed the realities of our vulnerable brothers and sisters has focused and galvanized our efforts here at Peace. Those present on Sunday continued in conversation for another half hour as we sought to absorb what we learned and began to discern next steps. To continue deepening our understanding of immigrant and refugee realities, please check out their website at www.lirs.org! Elizabeth Hunter Ashley is the featured soloist with Contra Costa Chamber Orchestra on Saturday, March 24 at El Campanile Theater in Antioch at 2 pm; and on Sunday, March 25 at Rossmoor Fireside Room, 4:00pm. You are welcomed to attend! Palm Sunday initiates Holy Week this Sunday at 10 am. We will gather in the Courtyard for our Palm Procession. Our FORUM will continue our Peace 60th Anniversary as we look at the formation and life of All Saints (one of our predecessor churches that merged to form Peace). If you were a member of All Saints, please come and share your personal stories! 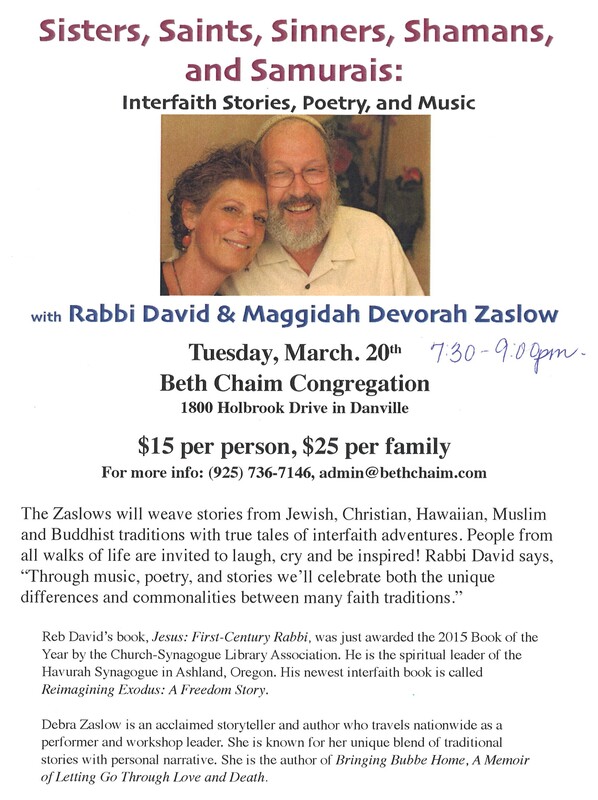 Our “Reimagining Exodus” class with author Rabbi David Zaslow was outstanding. We will keep working with this Exodus Theme throughout our 60th Anniversary Year. 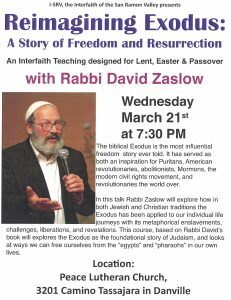 “Reimagining Exodus” has also charged our desire to celebrate another Freedom Seder this year on Maundy Thursday, March 29 at 6:30 pm. Last chance to sign up will be this Sunday! Don’t miss this extraordinary Meal of Mindfulness that teaches us to Remember Who We Are and unveils the Mystery of the Eucharist. The Monte Vista Choir has two evening performances at Peace on Thursday and Friday of this week. Over 500 students will be performing. You are invited! Friday night concert begins 7:00pm. The Jazz Church West hosts John Calloway on Easter Day at 5:00 pm. If you love Latin Jazz your heart will be danced into the heavens! Be cool – get jazzed. A new Art Exhibit is ready for you. The letters of the Hebrew Alphabet have been quilted by Barb Carpenter who created these for her Bat Mitzvat project a few years ago. Be sure to read the inscriptions about each. They are wonderful prayer invitations. Archbishop Romero: ‘We accomplish in our lifetime only a tiny fraction of the magnificent enterprise that is God’s work. Nothing we do is complete. No statement says all that could be said. No prayer fully expresses our faith. No confession brings perfection, no pastoral visit brings wholeness. No program accomplishes the church’s mission. Rather, we plant seeds that one day will grow. We water seeds already planted, knowing that they hold future promise. We lay foundations that will need further development. We provide yeast that produces effects far beyond our capabilities. 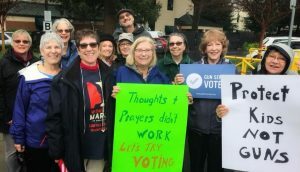 FORUM – Peace as Sanctuary this Sunday, March 18: We will have a Skype Conversation with staff members of LIRS/Lutheran Immigration and Refugee Services in Baltimore and Washington DC. They are the official agency of our national church body who have been involved for decades in immigration and refugee realities and struggles. They will help us to understand the context in which we find ourselves as we discern the Spirit’s leading among us. Your questions will be welcomed too! 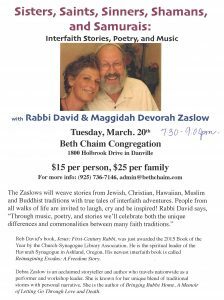 A delightful Interfaith Concert — next Tuesday night at Beth Chaim on Tuesday, March 20 (See flier below). If you love our Thanksgiving Eve celebration you will treasure this night as well. We need an evening of joy, music, story telling wisdom and the heart-warming presence of each other. Seder Meal and Celebration – Thursday, March 29 at 6:30 pm. Are you disturbed by Gun Violence and the killing of our youth? Irresponsible leaders? The devastation of our earth? Are you longing for an open, honest sibling partnership with Judaism and other interfaith friends? Hungry for joy, celebration and hope? Want to taste the inner meaning of the Eucharist? Then come to our Annual Seder! It will be charged with new insights from our Exodus Class. You will discover how we are part of an ancient stream of hope and transformation for God’s world. Sign up this Sunday or online. Easter is April 1 – April Fool’s Day! Who are the friends you will invite to join you and sit with you for this amazing, uplifting, soul-stirring and creative worship celebration?? Think on this, pray on this, begin inviting now. 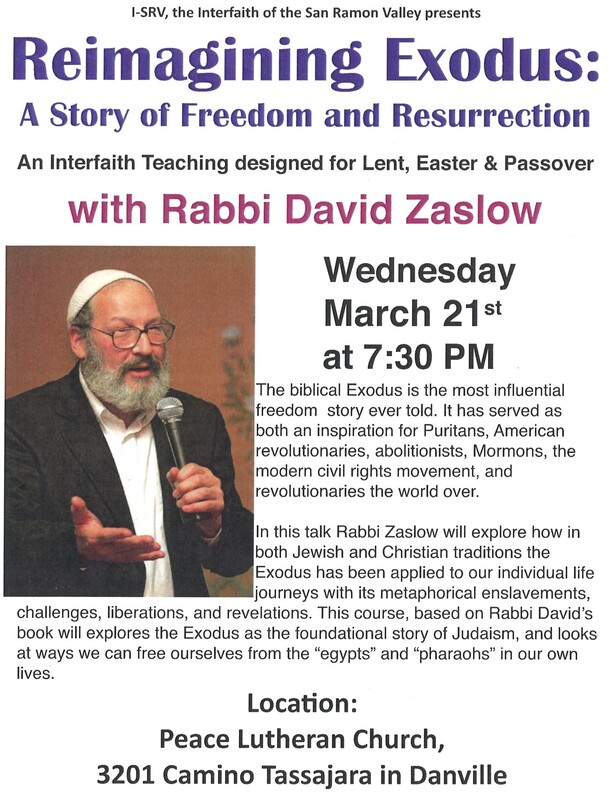 Our last ‘Reimagining Exodus‘ class will host author Rabbi David Zaslow at Peace next Wednesday evening at 7:30 pm (see flier below). Enjoy the passion of this ancient Liberation Story and discover the common DNA shared by Jews and Christians as we build our Interfaith Community in the spirit of peace and justice. The Monte Vista Choir will be performing 2 Concerts at Peace on March 22 and 23 (Thursday and Friday) next week. Over 500 students will be performing. You are invited to attend. 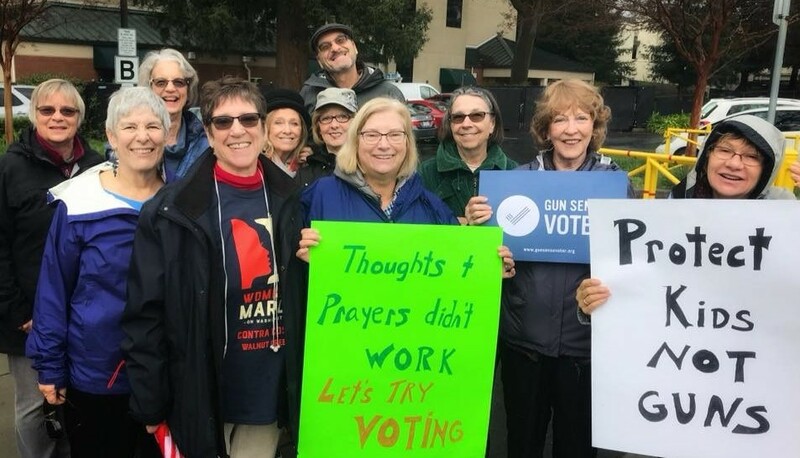 Peace Participates: The Peace Women and friends in this photo turned out to support the San Ramon High students who participated in the #EnoughisEnough Walkout this past Wednesday. The students cheered our contingent when they concluded their 17 minutes in honor of the 17 students who died in Parkland, Florida.